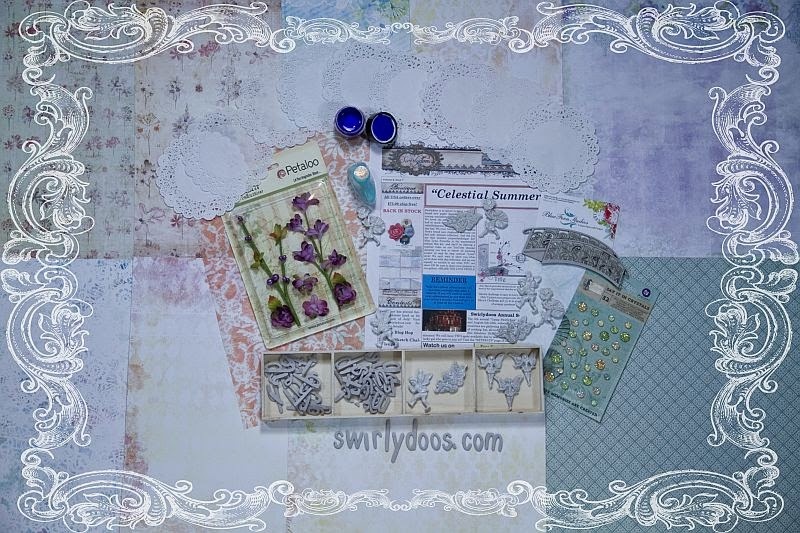 Scrapping Fancy: Swirlydoos July Reveal! 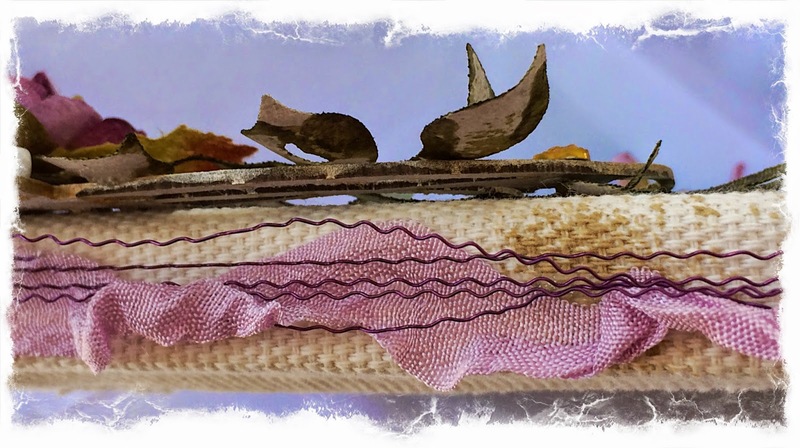 If you came here from Blue Fern Studio's blog, then you are on the right track. If not, go back to Swirlydoos' blog and start from there. We have some amazing projects for you to see today !! Make sure to leave a comment on all of the blogs for a chance to win!!! Make sure you have LIKED & FOLLOWED Swirlydoos on Facebook!!! I just adore the soft colors in this kit! Here are my first projects I've made with Celestial Summer. 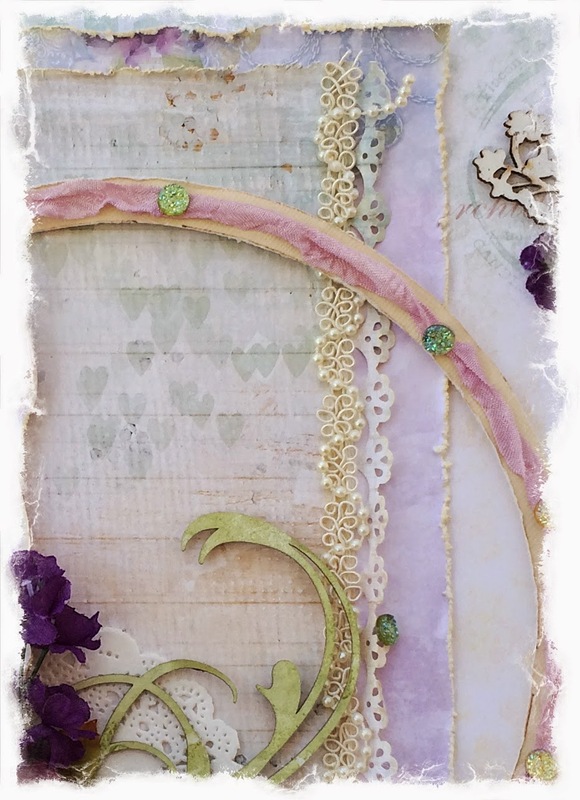 This is what I came up with for the altered canvas project add on this month, based on the monthly sketch. 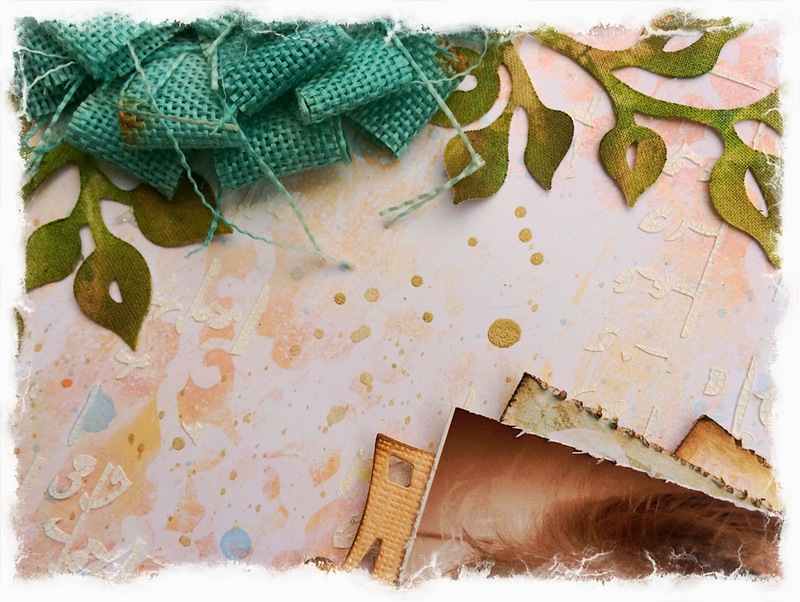 This close up shows the detail of the ivy die cut out of the canvas paper and painted with the Tattered Angels paint from the add on. Here's what the sides look like. 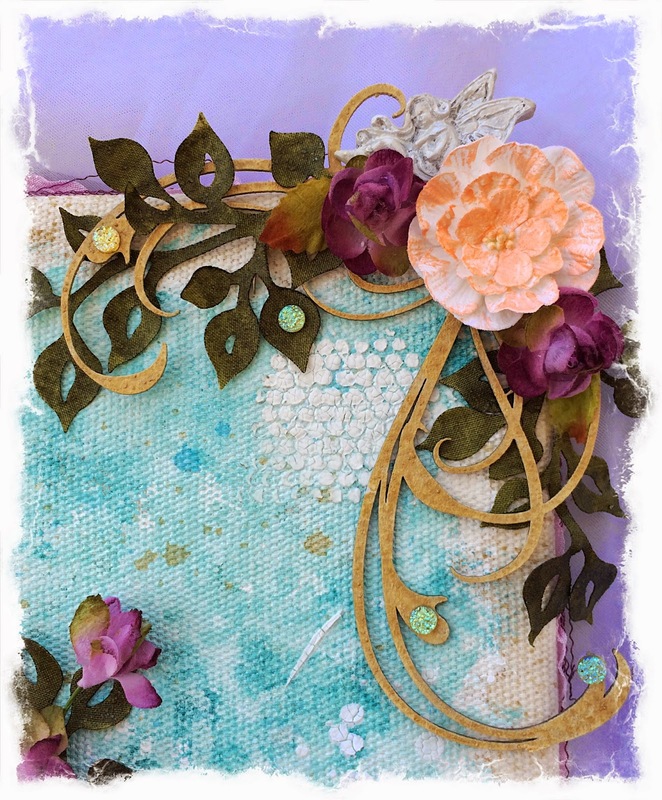 I added some seam binding from my stash and used the floral wire from the embellishment add on to add some dimension. Here's a close up of the BFS chipboard bridge. 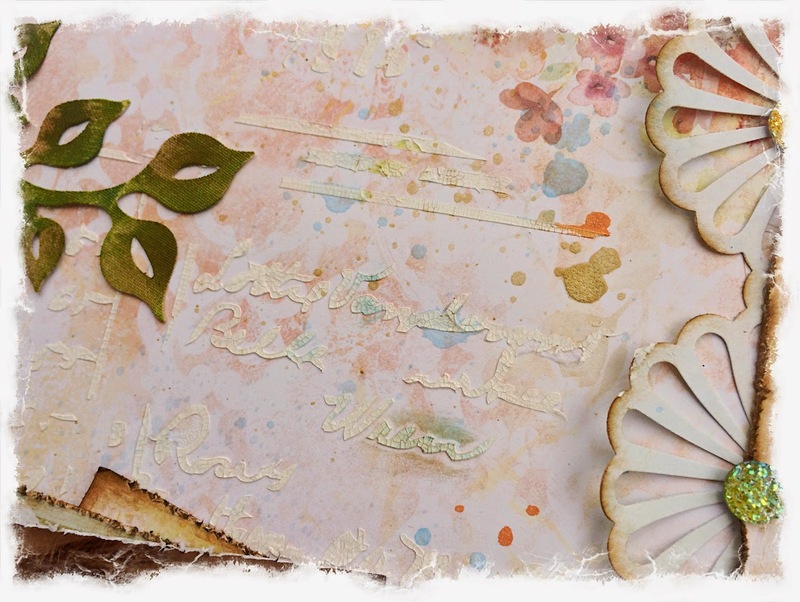 For this layout, I used some blue, peach, and gold mists to create splatters on the background paper after using the Crafter's Workshop Ledger stencil with my new favorite medium, Wendi Vecchi Crackle Embossing Paste. Here's a close up that shows the detail of the stencil. I added some blue chalk ink to parts of the paste after it dried. I used the ivy die from the project add on, and the canvas paper too. It's colored with the green Silks from the mediums add on, and then I added some brown chalk ink to tone down the color and give it a distressed look. Thanks for taking the time to look at my projects! The party continues over at Die~Namites Dies' blog. Have fun! Love your take on the sketch. The canvas is great. These are all so pretty, Rae! Your dd is growing up to by quite a cutie. 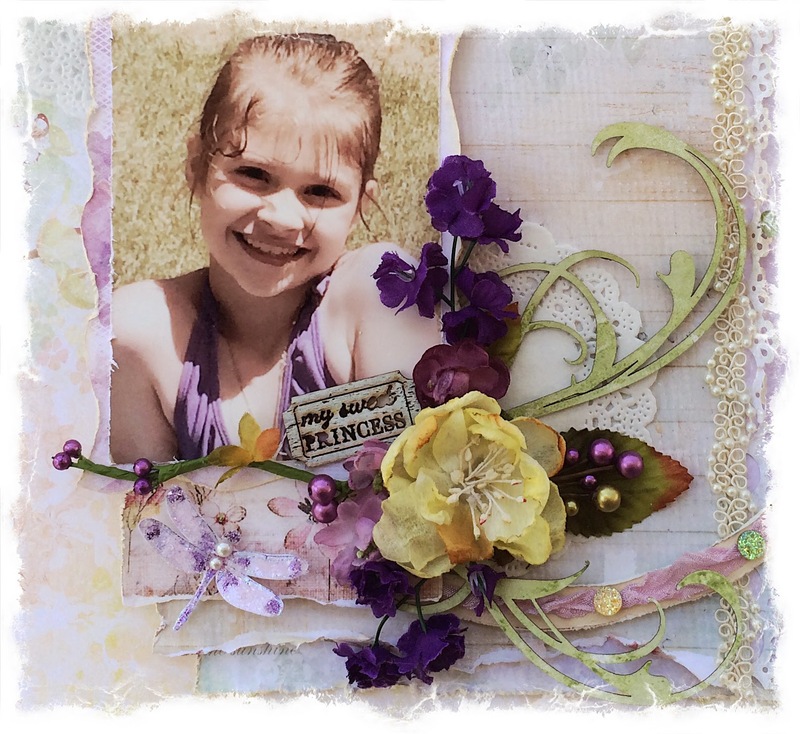 Gorgeous projects, Rae! Love the canvas! Thanks so much for sharing the video! Your canevas is beautiful and your pages absolutely stunning! Oh boy... LOVE them all! The video was great. I loved how you composed the background and the cool way you did the sides. Beautiful canvas! Super cute projects...I love the bridge. Beautiful Rae! 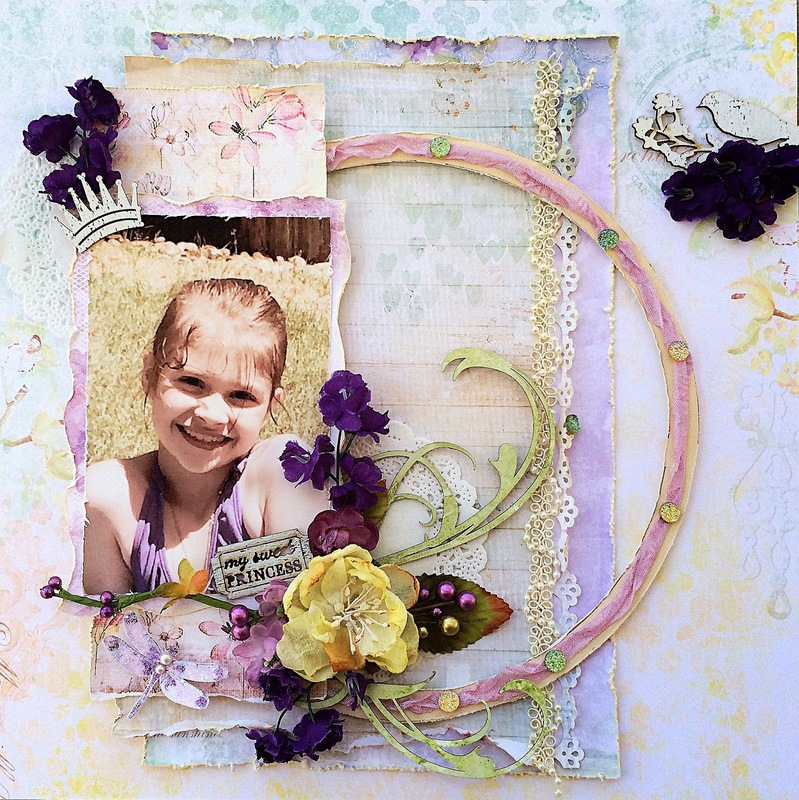 Your 'princess' layout is stunning! Wow!! So many wonderful projects this month. You did an awesome job. Rae: stunning, what a great release this month, i cant wait to start and play!!! I am envious, great talent. Lovely projects. Gorgeous canvas and awesome layouts. Wow, love that canvas project! Your stuff is beautiful. Thanks for the tutorial! as always...amazing! Love the canvas! Gorgeous projects all and what a fantastic video!!! 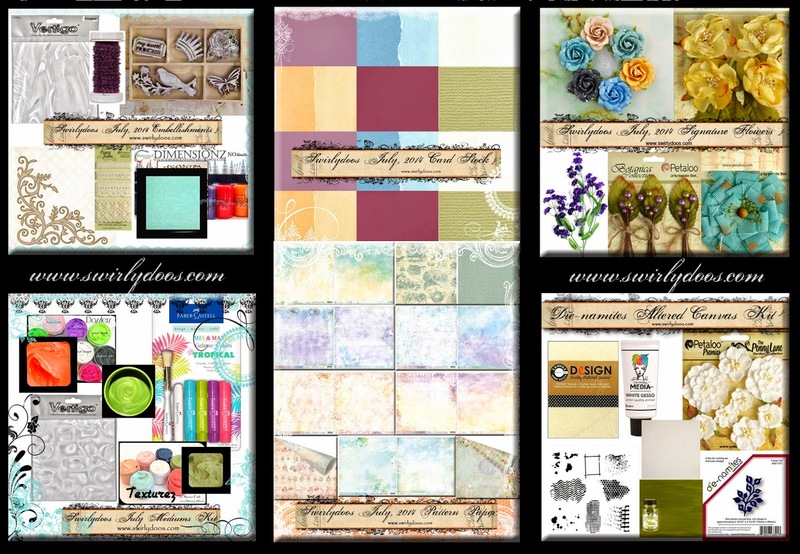 I love all of the layering and texture that you've given each layout (even the "simple" one)!!! Love you paint job on the bridge. That canvas is awesome and your LOs are beautiful too. Love your use of the Prima dot thingies. Got my kit today and they are gorgeous, the way the change color. 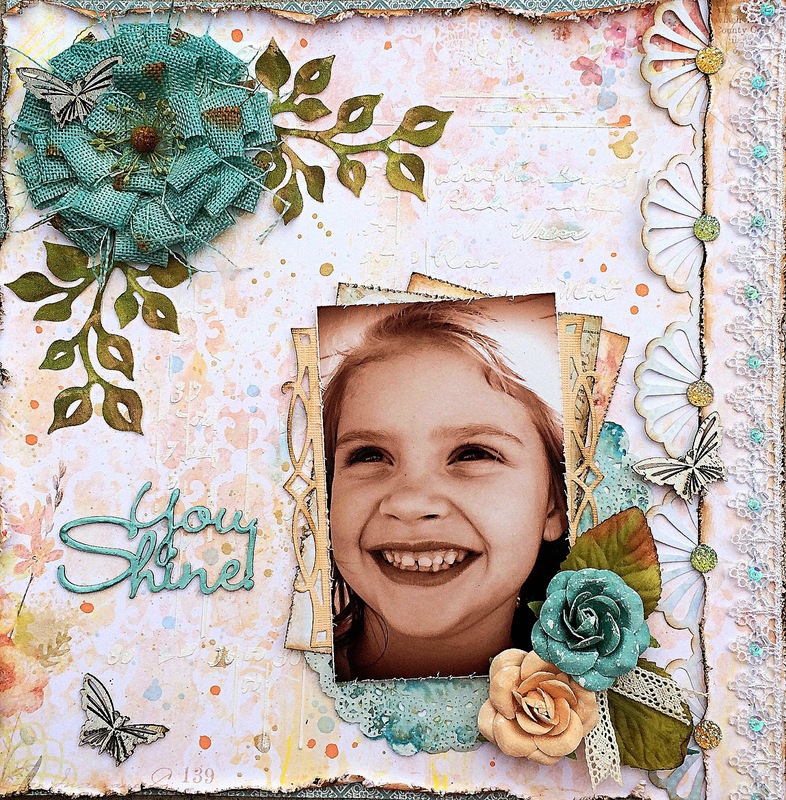 Your altered canvas and layout are both just gorgeous! Beautiful colors and details, and I love the dies you used to accent them! Fabulous kit! Such creative projects and I love your canvas especially! Wow! I love all your projects, but that canvas is gorgeous! I love all your masking and painting! Thanks for the tutorial video! I will be back later to watch again. What an amazing take on the sketch! 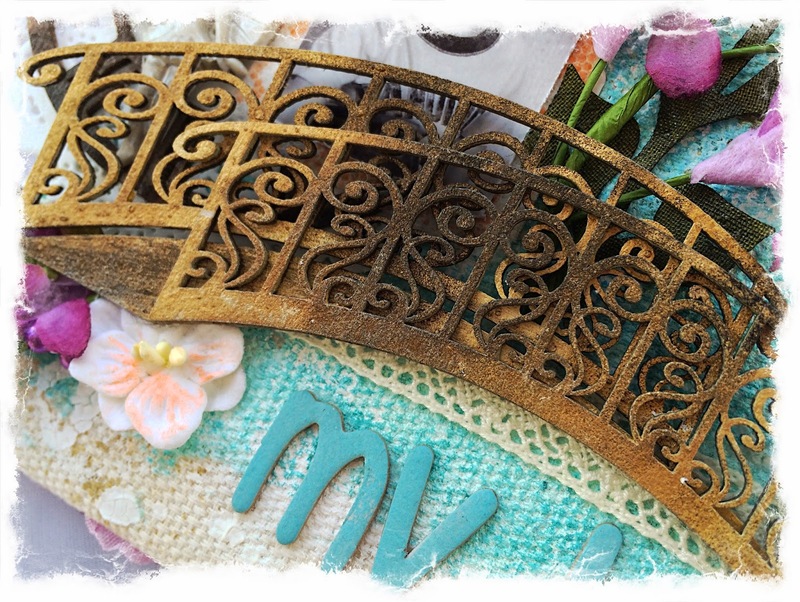 Great projects, Rae, and the tutorial is awesome! Think its time I tried my hand at a Canvas!!! Beautiful projects Rae! I love your canvas and your non mixed media layout!! Great projects very sweet and beautiful! Loving all the color combinations with this kit and the 3D bridge another of my favorites. Trying to figure out which frame you used on last layout. Just had to drop by and say how wonderful your projects are! WOW!!!! I so love those Beautiful projects of yours. And I have enjoyed the video so much! Thanks Rae, for all you do!!!! !